Pepper plants (Capsicum frutescens grossum), although biennials or perennials in warm climates, are cultivated as annuals in the United States. The plant is not unlike its relatives, the eggplant and tomato, in regard to its size and cultural requirements and like them also is grown for its fruit. Being a warm climate plant it requires a long growing season and consequently is usually started in hotbeds or greenhouses and transplanted into the field. Plants of the Large Bell or Bull Nose variety were transplanted into the experimental field at Norman, Okla., May 2. They were grown in rows 3.5 feet apart, the plants being placed 2 feet distant in the row. They soon became established and grew vigorously. Early Development.--On May 26 the first root examination was made. The taproots had been injured in transplanting and the result was a strong development of laterals. In each plant from 54 to 76 branches of variable length had grown from the original taproot and base of the stem. These originated in rows on opposite sides of the plant. The larger ones were 1 millimeter in diameter. Most of the roots spread rather horizontally, some obliquely, and a few penetrated quite vertically downward. A lateral spread of 15 inches and a maximum depth of 17 inches were found (Fig. 78). On the larger roots, near the base of the plant, laterals with a maximum length of 2.5 inches occurred at the rate of four to six per inch. Farther out they were fewer and shorter, and the last 2 to 3 inches of root ends were unbranched. Fig. 78.--The root system of a Large Bell pepper plant 24 days after transplanting into the field. Half -grown Plants.--At the second examination, 2 weeks later (June 10), the plants were 8 inches high and the diameter of the tops was almost 1 foot. Flower buds were appearing. The root system consisted of 40 to 60 strong laterals about 1 millimeter in diameter and 20 to 30 smaller ones. All originated in the surface soil at depths of 2 to 6 inches from the main axis of the plant, which was about 5 millimeters in diameter. Branches arose from two sides of the old taproot. The general shape of the root system had not changed although its area for absorption had been greatly increased. 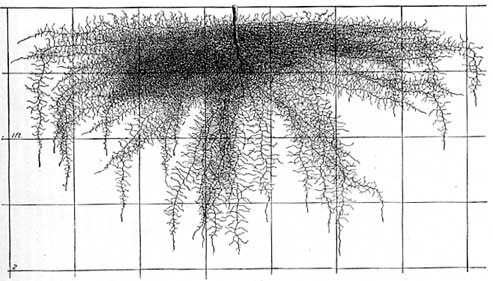 Figure 79 shows the great network of absorbing roots. 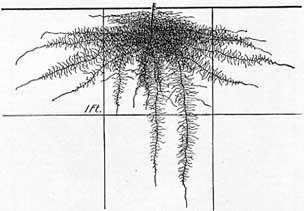 The horizontal roots rather completely filled the surface foot of soil to 18 inches on all sides of the plant, a few turning downward near their extremities. The obliquely and vertically penetrating roots occupied the third 6-inch level. The maximum depth was 2 feet. The finer branches formed a great network in the moist, sandy soil. Fig. 79.--Root system of a half-grown pepper about 6 weeks old. Maturing Plants.--A final examination was made July 17. The plants were 20 inches high and for some time had been bearing fruit. The stalks were nearly 1 inch thick but the bushy tops did not cover the ground between the rows. Root development had kept pace with that of the tops. The strong laterals were 3 to 5 millimeters in diameter. Those that ran horizontally usually turned downward, 1 to 2 feet from their origin, and extended into the second or third foot of soil. The vertically and obliquely penetrating roots were usually deeper, a few reaching the 4-foot level. The older portions of these roots, i.e., the first 1 to 1.5 feet, were poorly clothed with laterals and probably carried on little absorption. But their distal portions were densely covered with branches, the longer of these being profusely rebranched (Fig. 80). Fig. 80.--About one-fourth of the root system of a nearly mature pepper. 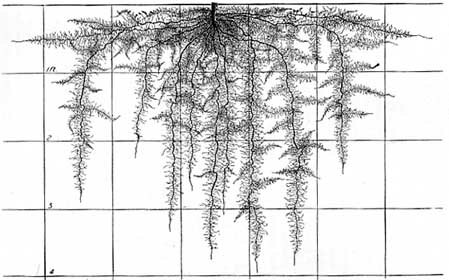 Absorption just beneath the plant and in the soil longest occupied was afforded by a network of shorter, finer, but wellbranched roots arising from the old root-stem axis. A total of 90 roots was found on a large plant. These, with their multitude of branches, filled the soil to 2.5 feet on all sides of the plant from the very surface to a depth of 3 to 4 feet. Summary.--Pepper has a strong taproot which is usually injured in transplanting. From the remainder of the taproot and the base of the stem very numerous, profusely branched laterals arise. These grow from horizontally outward to vertically downward, the bulk of absorption during the early life of the plant occurring in the surface foot of soil. When the flower buds appear, the root system thoroughly fills the soil 1.5 feet on all sides of the plant to a depth of 1 foot. Beneath the plant the second foot of soil is also quite thoroughly occupied. Mature plants have a lateral spread of 3 feet, the formerly horizontal laterals often turning downward into the second or third foot of soil. More oblique or vertical roots reach depths of 3 to 4 feet. With the finer branches, these form a very intricate and efficient absorbing system.